Hello there and welcome back to another day of Clearly Besotted Teasers. Have you seen that the Clearly Besotted shop are now selling lots of other goodies to go along with stamps and dies? They are now selling paper pads, stencils, tools, lots of inks and plenty more. One product they are also selling are the beautiful Sequin Shaker Mixes by Lucy Abrams. I wanted to combine some of these with my cards today. 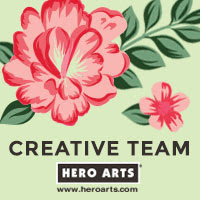 For my first card, I am using the new My Hero set. It is a great set that is tailored towards the males in our lives. For today's card though, I have used one of the accompanying sentiments that can be used for any occasion and combined it with one of the sequin mixes, for a shaker card. 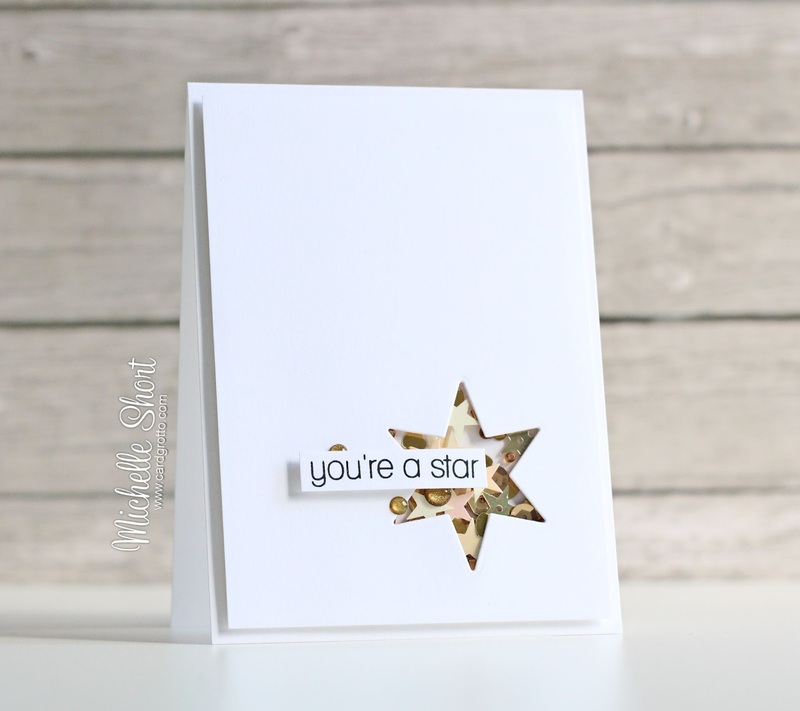 I first took a piece of white cardstock and ran this through my Cuttlebug to make an aperture using the largest star from the Superstar die collection (previously released). I added a piece of transparency to the back and then a ton of foam tape. I added some of the Gold Dust Sequin Shaker Mix inside and the applied a piece of white cardstock behind. The panel was then adhered to a white 4-Bar size card. 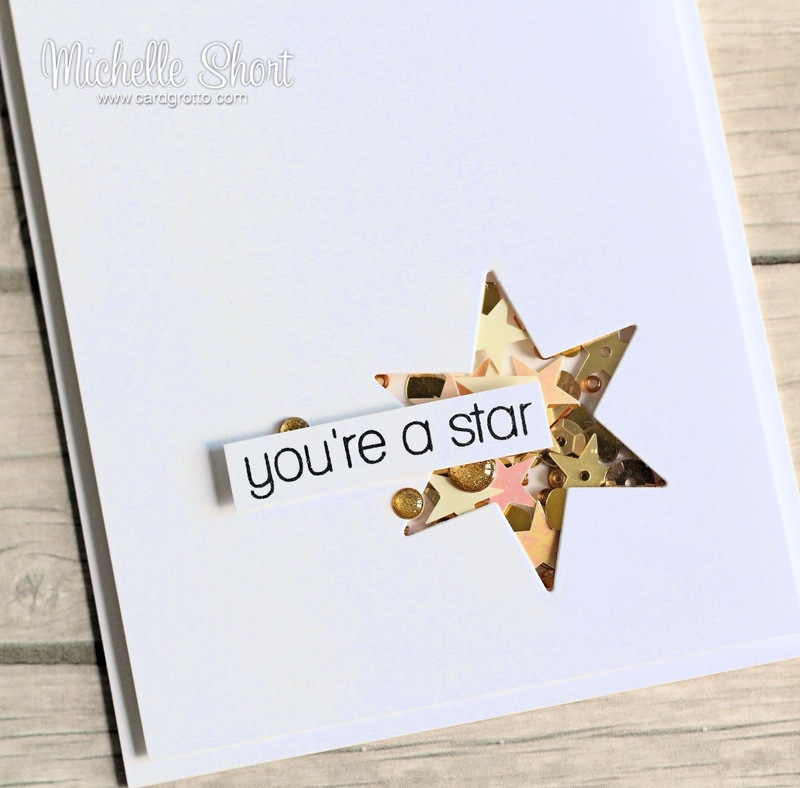 I took the 'you're a star' sentiment from the My Hero set and stamped this on to a separate piece of cardstock, cut this out and added this overlapping the star with more foam tape. I finished off by adding a few gold DB Sprinkles around the sentiment piece. My next card uses one of the new shaker dies, also designed by the amazing Lucy Abrams. I took the thanks shaker die and cut this from a panel of white cardstock. Like the card above, I added some transparency behind and then this time I used foam sheet to make the shaker window. I applied Sequin Shaker Mixes in Glacier and Iridescent White to this and then applied another piece of white cardstock to the back. The panel was then adhered to a white card base. I love that these dies make such quick and simple cards. You do not need to add anything else to it (of course you could though!). Although simple to make, I did make a video showing how I did it. Thank you so much for visiting me today. 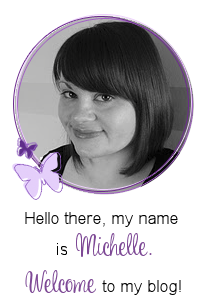 As always, please pop over and see Stephanie, who will have links to all the other DT sharing today. I hope you will be able to come back and see me tomorrow for more teasers. Have a lovely day! Two great cards! Love the shaker element with those lovely sparkles! That's a great die. Your card is so pretty with the crisp colors and clean lines! Thanks for sharing. Love them both!!!! Gorgeous cards! Great CAS shaker designs. 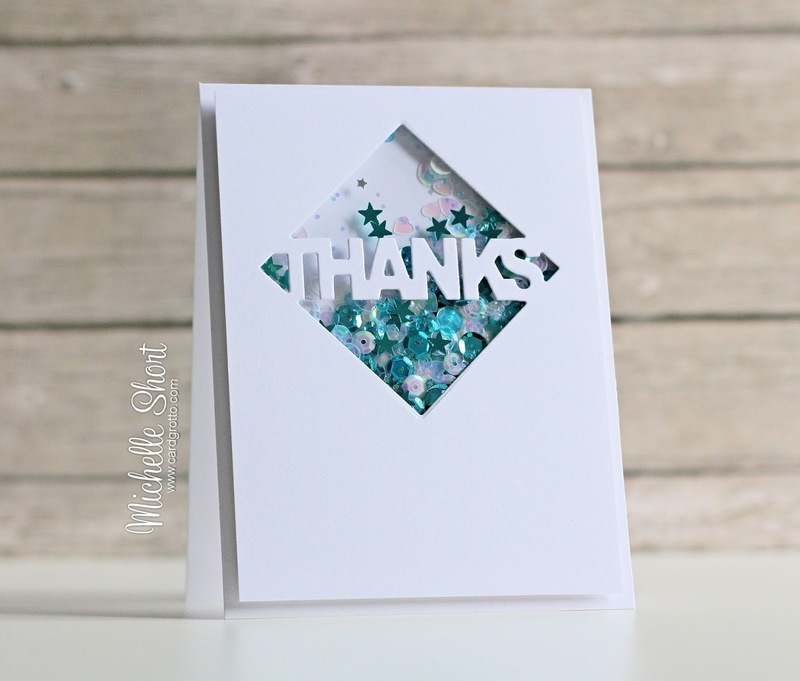 I really like these new dies and the glacier and white sequin mix is fabulous. Fantastic shaker cards, Michelle!! I love those sequin shaker mixes---so beautiful! And the new dies look like lots of fun as well!